According to recent research from Shopcology, almost 50% of millennial moms say that they want to be the first to try new technology. 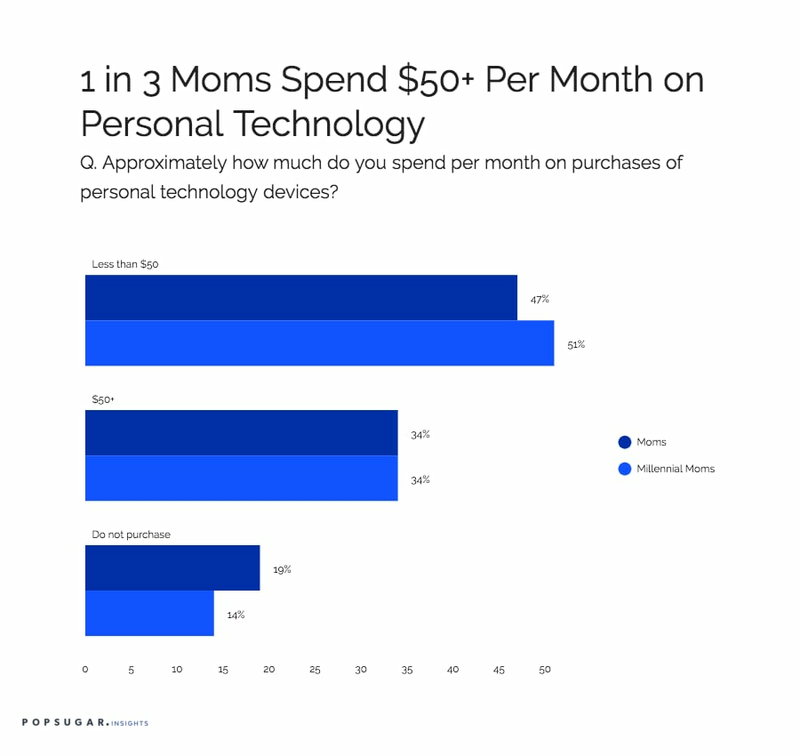 As part of the POPSUGAR Insights #Momstamina study, we wanted to explore whether this desire to try out new technology translated to the spending habits of millennial moms, so we asked them to share their monthly spending habits as well as their ownership of and intent to purchase specific types of tech devices. Overall, we learned that 52% of millennial moms spend an average of $50 or less on personal technology devices, with 34% saying that they typically spend over $50 per month in this category. A little over one in five millennial moms say that they spend over $100 per month on personal tech. The same percentage of moms overall (34%) say that they spend more than $50 per month on personal technology. Overall, millennial moms are more likely to own smartphones, smart TVs, and streaming devices (like a Roku, Chromecast, or Apple TV) than moms overall. Over nine in 10 (92%) millennial moms currently own a smartphone, 55% own a smart TV, and 31% own a streaming device. Millennial moms are as likely to own a computer (89%) and a tablet device (72%) as moms. Millennial moms are actively planning to purchase personal tech devices in the next six months, including mobile phones/tablets and new computers. Over one in three millennial moms (35%) are planning to purchase a new mobile device in the next six months, and millennial moms are 13% more likely than moms between the ages of 25 and 49 to be planning the purchase of a new mobile device. Additionally, one in five millennial moms is planning to purchase a new computer, but millennial moms are 10% less likely than moms between the ages of 25 and 49 to plan to purchase a new computer in the next six months.